Vancouver, BC – Skyharbour Resources Ltd. (TSX-V: SYH)(OTCQB: SYHBF)(Frankfurt:SC1P) (the “Company”) is pleased to announce the results from its 2018 fall diamond drilling program at its 100% owned, flagship 35,705 hectare Moore Uranium Project, located approximately15 kilometres east of Denison Mine’s Wheeler River project and proximal to regional infrastructure on the southeast side of the Athabasca Basin, Saskatchewan. 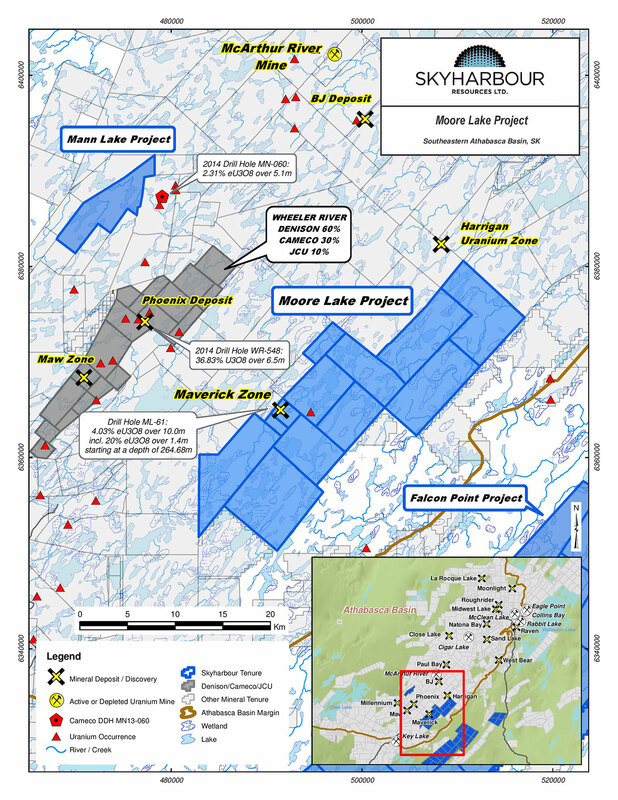 Drillhole ML18-14 intersected high grade uranium mineralization within the Main Maverick Zone consisting of 3.11% U3O8 over 1.8 metres within an intercept containing 0.56% U3O8 over 15.2 metres. This represents one of the broadest zones of uranium mineralization intersected on the property to date and occurs from 264.5 metres to 279.7 metres downhole, and largely within the underlying basement rocks. Of particular note is that the uranium mineralization continues well into the basement rock in the above reported intercept illustrating the strong discovery potential below the unconformity. The recently completed fall diamond drilling program was expanded and totaled 3,800 metres in eight drill holes. These holes which were drilled to a depth of up to 750 metres tested both sandstone/unconformity and basement-hosted targets along the high grade Maverick structural corridor.